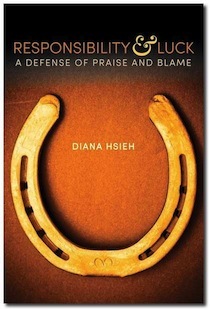 I'm delighted to announce that my first book, Responsibility & Luck: A Defense of Praise and Blame, is now available for purchase in paperback, as well as for Kindle and Nook. The book defends the justice of moral praise and blame of persons using an Aristotelian theory of moral responsibility, thereby refuting Thomas Nagel's "problem of moral luck." It's an academic work but accessible to anyone with an interest in philosophy. In his famous article "Moral Luck," philosopher Thomas Nagel casts doubt on our ordinary moral judgments of persons. He claims that we intuitively accept that moral responsibility requires control, yet we praise and blame people for their actions, the outcomes of those actions, and their characters -- even though shaped by forces beyond their control, i.e., by luck. This is the "problem of moral luck." For more information, including two sample chapters and the detailed table of contents, visit the book's web page. Again, you can purchase Responsibility & Luck in paperback, as well as for Kindle and Nook. Like every author, I depend on good reviews of the book on Amazon, social media, and elsewhere. So once you've read Responsibility & Luck, please review it!